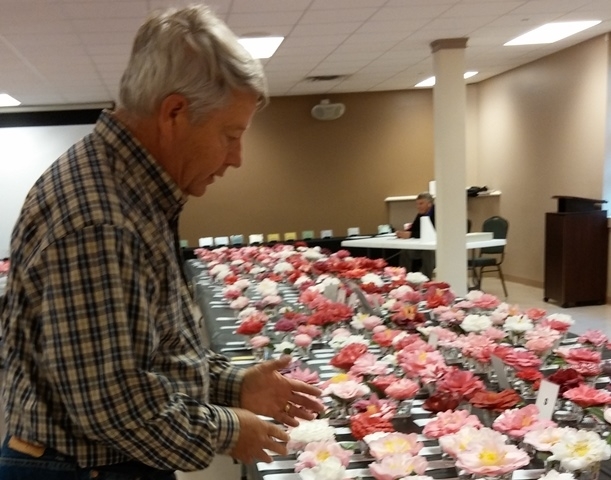 Find out about camellia shows and becoming a camellia judge. Camellia shows are a way for the ACS and local societies to showcase our favorite flower the camellia. The shows in the United States are competitive shows, which contain a variety of categories. The show season starts in October and goes through April. The shows are sponsored by different societies throughout the United States in cooperation with the ACS. The ACS also sponsors one of these shows in conjunction with our annual convention and meeting, in which the National ACS awards are given. Shows provide opportunities for camellia enthusiasts to get together not only to show their blooms, but to spend time with friends and acquaintances. It also provides an opportunity to see many varieties of camellias – the old, the new, and the up coming varieties. Many shows will have camellia plants of different varieties for sale that do well in their area. If you are interested in attending a camellia show, then check out the show dates in your area. Click here to review the show calendar to find a show. Questions? Contact the ACS Judge Registrar by email. Click here to send an email to Lorie Huff. Judging is a privilege and not a right. Judges should be prompt and alert. KNOW THE RULES: Judges should read the ACS rules for judging at least once per year. KNOW THE DIVISIONS AND CLASSES AT LOCAL SHOWS: Judges should make themselves aware of the classes and divisions of each local show they judge. BE CONSISTENT: Judges should judge their assigned section following the same criteria throughout their assignment. The show should look like, it has been judged by the same team of judges. LISTEN TO THE CHAIRMAN OF JUDGES: The chairman of judges will give you instructions on how they would like their show judged. It is important that you judge following these instructions. INDRODUCE YOURSELF TO YOUR TEAM AND YOUR CLERKS: This is a courtesy that you should extend to your team and to the clerks that are clerking for your team. Not everybody knows you. There are always new judges and local people helping out as clerks. THANK YOUS: Thank you should be extended to your team members, your clerks, and to the chairperson of judges for the invitation. STAY CURRENT: Judges should stay current with the latest introductions of camellias. Read your ACS journals and yearbook, and other publications that show pictures and give descriptions of new introductions. LOOK THEM UP: If you do not know a variety that you are judging, don’t guess. Look them up in the Nomenclature Book or ask the Chairman of Judges. KNOW THE FORMS: As a judge you should know the basic forms of camellias. Be aware of the different forms a particular variety can have. If you are not sure then look it up. KNOW ABOUT COLOR AND MARKINGS: Judges should be aware of the color and markings that the camellia you are judging has. KNOW THE SIZE: Size should not be the only criteria for giving a blue ribbon. To often the largest bloom gets the blue ribbon and yet the form and color was better on one of the smaller specimens. BE AWARE OF TEXTURE AND SUBSTANCE: If a variety has special, features, such as creped, smooth, sheen, etc. make your self aware of these features and give more points if they have them. CONDITION: The blooms should be fine specimens. They should be free of petal blight, insect holes, etc. WORK AS A TEAM: When judging you should work as team, taking turns as lead and discussing before making the award. DON’T BE A TEAM DOMINATOR. DON’T STAND AROUND IN STAGING AREA: Before final judging begins and during the process of setting up for ties and after judging is completed, judges should not be in the staging area of the final judging because it makes it difficult for the people in charge for getting their jobs done. If you are not involved then you should step away until the flowers are placed on the head table and it is ready for viewing. DON’T BE A COMPLAINER: If you don’t like the way a local society is running their show you have some options, but don’t sit back and complain. You could offer helpful suggestions at an appropriate time (not at show because they are busy), you could offer to help out, or you could decline the invitation to judge. NEVER VOTE FOR YOUR OWN: When you are judging the final judging for the Best of Divisions and you have a flower in the division you should enter a NO VOTE or X in that category. The only exception to this rule is in some shows, which have a weighted vote, which allows you to judge in the division. If you are not sure then ask the Chairman of Judges. KEEP QUIET: A judge must refrain entirely from voting in any decision, which involves one of his or her own exhibits. REFUSE TOBECOME INVOLVED: Refuse to become involved in any way in a dispute over ownership of exhibits; whether or not blooms have been grown under protection and/or chemically treated; the meaning of ambiguous words or terms; or any question about the management of the show. Do have an obligation to exhibitors - Blooms will judged fairly and uniformly by rules of show and ACS. Do have an obligation to general public - They attend shows for guidelines in purchasing camellias. Do refuse to be involved in any dispute. Do abide by ACS and local rules. Do comply with the chairman of judges wishes regarding leniency. Do judge as to how the flower appears now, not sometime in the future. Do be objective when voting for best of class or show. Do improve your knowledge of varieties by always viewing the entire show. Do attend an ACS authorized judge’s school or judge’s symposium at least once every five years. Do be courteous to other judges, clerks and show viewers. Do dress to prevent bloom damage (Watch your coats, purses, jewelry, etc.). Do bring and use your Nomenclature Book to each show. Do answer your judging invitation promptly. Do leave your prejudices at home. Do stay with your team. Do walk your assigned area before you begin judging. Do pay attention to your chairman of judges instructions. Do discuss flower merits or faults with your team members. Do read the ACS Show Rule Book each show season. Do read each local show schedule before judging. Do step back or remain silent if your flower is in the class being judged. Do abide by the “majority rules” in all classes. Do split classes if there are good flowers of two forms. Do be patient with novice judges and encourage their participation. Do make yourself available for further assignments. Do take your judging seriously. Don’t vote your own flower. Don’t complain about your judging assignment. Don’t be influenced by the newness or rarity of a bloom. Don’t give a blue ribbon unless one is warranted. Don’t be a dominate judge, it’s a team effort. Don’t wander away from your team. Don’t leave judging area before all judging and all voting is completed. Don’t send petal blight to the head table. Don’t be a space hog, change positions and let everyone see. Don’t move or touch flowers unless necessary for better observation or to remove from wrong class. Don’t be influenced by size alone. Don’t wear perfume or cologne if there is going to be a fragrant class at the show.